Mark Mitchell, a professor of veterinary clinical medicine, led the research team that found antibiotic-resistant bacteria in seven species of sharks and one redfish species captured in waters off Massachusetts, Florida, Louisiana and Belize. CHAMPAIGN, Ill. - Researchers have found antibiotic-resistant bacteria in seven species of sharks and one redfish species captured in waters off Massachusetts, Florida, Louisiana and Belize. Most of these wild, free-swimming fish harbored several drug-resistant bacterial strains. Graphic produced by Diana Yates. 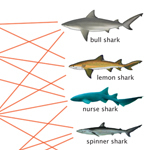 Photo credits: Bull shark (NSW Department of Primary Industries); Lemon shark (drawing by Robbie Cada); Nurse shark (modified from photo by Joseph Thomas); Spinner shark (image by Dieno); Blacktip shark (modified from photo by Albert Kok); Smooth dogfish (image from U.S. Fish & Wildlife Service). Patterns of antibiotic-resistant bacteria in sharks captured in waters off Belize, Florida, Louisiana and Massachusetts. Nurse sharks in Belize and in the Florida Keys hosted the greatest number and diversity of drug-resistant bacteria. Fish that were captured closer to shore and in more populated areas harbored the greatest number and diversity of drug-resistant microbes. The researchers also found multidrug-resistant bacteria in fish at nearly all of the study sites, said Mark Mitchell, a professor of veterinary clinical medicine at the University of Illinois and senior author of the paper. 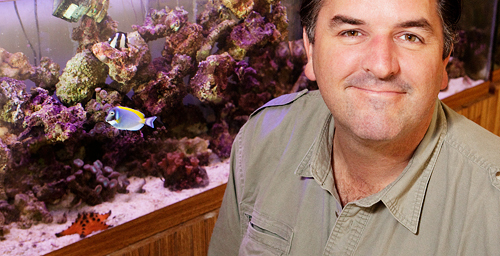 Random mutations may account for drug-resistant bacteria in marine environments, Mitchell said, but the fact that the fish living closest to human-dominated landscapes harbored the most drug-resistant bacteria points to a human cause. Bacteria from sharks off Martha's Vineyard in Massachusetts and in offshore Louisiana were resistant to the fewest number of antibiotics, while sharks in the Florida Keys and Belize harbored bacteria that were resistant to amikacin, ceftazidime, chloramphenicol, ciprofloxacin, doxycycline, penicillin, piperacillin, sulfamethoxazole and ticarcillin. Redfish in the Louisiana offshore site hosted more varieties of drug-resistance than sharks in the same waters. This may reflect differences in their feeding or migratory habits, Mitchell said. "There are estimates of over 100,000 deaths from infections in hospitals per year, many of them from antibiotic-resistant organisms," Mitchell said. "And we're creating even more of these organisms out in the environment. ... Unfortunately, as these things collect, there's probably a threshold at some point where there's going to be a spillover and it will start to affect us as a species." This study was the thesis for first author Jason Blackburn, a former master's student at Louisiana State University now on the faculty at the University of Florida. The team included researchers from LSU, the University of Florida, the U. of I. and the University of Southern California.